The Heist is a silly book, but I mean that in a good way. It’s a caper, a romp. Nick Fox is a con-man, and he’s good at what he does. He even talks the FBI into hiring him to run cons on some of the big wigs on their wanted list that they just can’t get to. And they team him up with Kate O’Hare, the agent who has been tracking him for years and has finally caught up with him. She’s not thrilled with the idea, but goes along in the end. The last sentence of the blurb sums up the adventure pretty well. It’s ridiculous and over the top and just fun. The attraction between Kate and Nick is evident, although it’s just simmering under the surface at this point. The characters are slightly on the one-dimensional side, but I love Kate’s dad. Who else would promise to break her out of prison if need be? I’m not a Stephanie Plum fan, but I like everything else I’ve listened to by Evanovich, even her light romances. The thing is I’ve listened to all of them, not read any in print aside from two of the Plums. Maybe she’s an author that just works better on audio for me. The narrator Scott Brick does a good job. It ‘s a funny story, but with characters who take themselves seriously, and he straddles that line well. 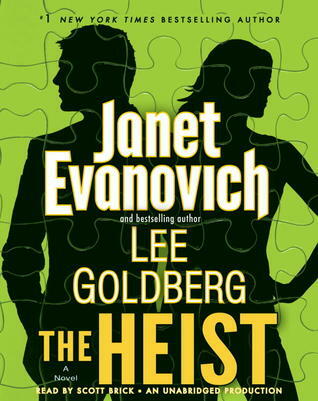 The Heist is a popcorn book, a treat but with little real substance, not a sugary sweet romance, an adventure with bad guys and guns and funny lines. I am not sure but glad to hear it worked for you ! I like Scott Brick and need a silly book from time to time so would consider this audio. Something about the cover bothers me! But I love the reasons for all of us loving different kinds of books! I gave up on Evanovich a few years ago. I love Stephanie for quite awhile and then the series started being the same book over and over again. I’ve read or listened to a few that have been co-authored but have’t been wowwed yet.